How would you like to double, triple or even quadruple your titles without writing a single extra word? The United States' original motto "E Pluribus Unum" translates as "From Many, One", a reference to the creation of one country – the USA – from the myriad colonies that fought the British for independence. E Unum Pluribus, therefore, translates to "From One, Many." No, I'm not advocating chopping long books into short ones just to game the system. But rather turning one book into many, without writing an extra word, and at a stroke increasing your potential audience reach by literally hundreds of millions. Translation is the name of the game, and if you haven't been thinking seriously about translations so far, I can promise you will be by the time you finish this post. English is the lingua franca of the world. As authors it is our single greatest asset. We have immense reach simply by writing in the world's most widespread language. But beyond that reach are not just hundreds of millions, but literally billions of readers who do not speak or read English. Back in 2010 Big 5 publishers (then the Big 6) could get an elite handful of top authors into translation around the globe, but even these had limits. Their books would only be available in a few big stores in a few big cities in the richer countries of the world, and few people could afford them. I'm an indie author. No Big 5 publisher backing me. But right now I've got titles live and selling in English, French, Spanish, Portuguese, German and Chinese. I have translations underway into Japanese, Norwegian, Dutch, Afrikaans, Arabic, Hindi, Urdu and Ukrainian. And I'm actively seeking translation-partners in Vietnamese, Indonesian, Filipino, Turkish, Polish, Hungarian, Romanian, Swedish and a host of other languages too long to list here. So much has changed, and the changes are profound. Ponder these words of wisdom from Newsweek in early 1995. "We're promised instant catalog shopping — just point and click for great deals. We'll order airline tickets over the network, make restaurant reservations and negotiate sales contracts. Stores will become obsolete. So how come my local mall does more business in an afternoon than the entire Internet handles in a month?" Amazon was barely six months old when that article was written. Ebooks were slightly more than a figment of a 14 year-old's imagination, but not by much. Back then the internet existed, but who really cared? To connect to the internet you not only needed an expensive desktop or laptop computer, but you needed reliable electricity, a landline telephone connection (ideally next door to the telephone exchange), and an expensive data plan from an ISP. If you wanted to exchange an email with someone in another city or country, or even your next-door neighbour, the person at the other end had to have the same equipment. And they had to have it switched on and be sat at the desk to know you'd emailed them. The internet was the exclusive preserve of the wealthy and tech savvy in big cities in a handful of countries. And who really needed it anyway? What was it for? In April 2007 the first iPad had appeared. But it was just for geeks. YouTube, Facebook and Twitter existed, but few people were taking them seriously. Twitter was just one year old. YouTube was just two years old. Facebook was the granddaddy, having launched in 2004, but apart from college students, who knew? The social media experts of the day were advising people to ignore this new fad, Facebook. MySpace was the height of social media savvy in 2007. And then came the Kindle. Amazon had come of age by then and was not only delivering cheap print books to our door on a scale unimaginable in 1995, but in 2007 it had just brought out this new device, the Kindle. But the internet was still the exclusive preserve of the rich First World countries. You still needed an expensive desktop computer, reliable electric, a landline telephone connection, and to be living in a big city where a local ISP existed. By 2009-10 strange stories were emerging from Japan that people were reading books on their phones. Books? Most of us were still struggling with text messages that we had to abbreviate to mindless gobbledegook just to cram onto those tiny screens. The experts assured us it was just a fad. Reading on phones was "peculiarly Japanese" and would never happen outside of Japan. Today we can now not just buy and read books, exchange emails and engage in social media on phones and tablets, but do our weekly shopping, book plane tickets and make restaurant reservations, stream TV and films… It would be quicker to list what you can't do on a phone. And not just in big cities next to the telephone exchange like in 1995, but anywhere a wi-fi connection can reach. At which point you may be wondering what this has to do with authors getting their titles translated into other languages. Way back in 2009 when the Kindle opened to indie authors, the ebook market was, for all practical purposes, the United States. And the ebook market was a handful of people who owned a Kindle or another brand of ereader. In 2010 that market became the US and UK. Both English language. Today there are over a dozen Kindle stores across the world, not just in English (US, UK, Australia, Canada, India) but in Spanish, French, German, Italian, Dutch, Brazilian Portuguese and Japanese. There's even a Kindle China store. That alone should have you thinking seriously about translations. The Kindle store may be the biggest ebook store in most of those countries (Canada, the Netherlands and China being the exceptions) but ebooks are being read all over the world. The Guadalajara International Book Fair in Mexico is in November. It's the biggest Spanish-language book fair in the world. Publishing Perspectives reported that the Guadalajara Rights Center – a meeting place for publishers to exchange foreign-language rights - had sold out its 125 tables several months in advance, a sure sign of trad pub's growing interest in the global Spanish book market. There is a global New Renaissance unfolding right now, and the Big 5 are preparing to rake in the cash from it. Penguin Random House (PRH) this month reported parent company Bertelsmann has seen its highest revenues since 2007, thanks in large part to PRH's expanded global reach. PRH reported "excellent performance in Latin America and double-digit growth in (Latin American) e-book sales." There's a new ebook megastore, Orbile, opening in Mexico this month, and Kobo is handling its ebooks. Amazon has Kindle stores in Mexico and Brazil. Apple is in Latin America. Google Play has ebook stores in 17 Latin American countries. And there are also countless "local" ebook retailers in the region. The big publishers are well positioned to reap the rewards as the Latin American ebook market blooms. Indie authors can do well there too. Easy access through the above-mentioned stores, and just this month the Italian aggregator Streetlib announced a deal to get indie titles into the key Latin American ebook retailer BajaLibros. As for the rest of the world…opportunities abound. The global ebook market is about to blossom. Up until the start of this decade, the World Wide Web was something only the lucky few could actually participate in. For most people in the Third World, reliable electric and a landline telephone connection were unaffordable luxuries you hoped your grandchildren might one day live to see. But then "globile" happened. Global mobile, that is. The phenomenal rise of the global smartphone, no longer the exclusive preserve of the rich west, but an everyday device for people across the planet. The rest of the world – even the poorest nations on the map – have quite simply skipped those painful desktop decades and gone straight from the pre-internet (and even pre-telephone) era to the age of 4G internet and smartphones. Today there are over two billion – no, that's not a typo – two billion people around the world with a smartphone in their hands and a connection to the internet. That's two billion people who could potentially be reading your ebooks. Many read English, of course. We are soooo lucky! And for the rest of the planet, English is the second language of myriad countries, and that number is growing by the day. In China there are over 300 million people learning English right now, and millions more are signing up every month. Very soon there will be more English-language learners in China than there are people in the United States. But that's a tiny fraction of the Chinese population. If you want to top the Chinese ebook charts you need to think seriously about a translation into Mandarin. A reminder – "globile" means global mobile. It's this brave new world where two billion (and rising) people around the planet are our potential audience. How does an audience of five billion sound? Seriously. That's how many people will be connected to the internet and potentially reading our books in the very near future. As of this summer India officially has more internet users than the USA has people. Thirty million more! And fifty million of those connected to the internet for the first time in the past six months. To ram home the significance of this, the USA has just 280 million people online. Yet the USA has 86% of its population online. India? Just 27%. By end 2017 India will have five hundred million people connected to the internet. And here's where it gets really exciting. Those projections are based on current take-up rates. They don't take into account projects like Google Loon, Internet Saathi or Facebook Aquila, which are going to wildly accelerate such take-up. You may be thinking Google Loon is a term of abuse you shout at Google's driverless cars, but Google has a vision where everyone on the planet will be connected to the internet. Not in some distant century, but in the next decade. Google Loon is Google's internet balloon project. High-flying internet-relay balloons that will bring the internet to remote areas where a traditional cable or wi-fi connection simply isn't viable. Google Loon plans to bring the internet to remote parts of the USA and Canada, for example, currently without access. And it plans to bring the internet to the Third World. In July Google signed an agreement with Sri Lanka to give the entire island internet access by balloon. A case of science-fiction literally becoming reality. Arthur C. Clarke, who lived in Sri Lanka, "predicted" the idea many years before. Google also has more down-to-earth methods of getting the world connected. Google's Internet Saathi project, just launched this summer, is taking the internet to millions of women in remote villages in India. By bicycle. Trained teams touring India by bike showing rural women how to connect to the internet with their smartphones. It's a scenario that, just a few short years ago, was quite unthinkable. Facebook's Internet.org and Aquila drones. And it's just the beginning. Facebook is also in on the act. Facebook has this wonderful project called internet.org, which brings (limited) free internet access to some of the poorest nations on the planet. And then there's Facebook's Aquila drones. While Amazon is working on drones that will one day deliver your POD book to someone's door, Facebook's Aquila drones – each the size of a Boeing 747, solar powered and flying at 60,000 feet – will be delivering your ebooks, tweets and Facebook posts to places that right now can only dream of connecting to the internet. Facebook and Google are also using satellites to bring the internet to the world. And they’re not alone. At the end of August the third Immarsat Global Express broadband satellites was launched from Kazakhstan and will orbit over the Pacific. Also at the end of August the Pacific Caribbean Cable System (PCCS) started commercial operations. The PCCS links the USA, via Florida, with the Caribbean nations, Central America and northern South America as far as Ecuador, meaning millions more people across the Caribbean and Latin America have access to 4G-standard internet service. But let’s come back to the Internet Saathi project to remind us why this matters to authors. Over the next eighteen months five million women in 45,000 Indian villages will be getting lessons in how to use their smartphones to connect to the internet. Google last month tweeted that the first rural women student, Jayant, had successfully used her smartphone to look up information about the cattle she rears to support her family. The internet is a truly wonderful thing. But it won’t just change Jayant’s life in practical terms like providing information about her cattle. It will also open up a world of entertainment and social engagement previously unknown to her. How long before Jayant and the other five million women in this project will friend you on Facebook, retweet one of your tweets, or read one of your ebooks? But Google's South Asia VP Rajan Anandan warns that while the English language has dominated the growth of the internet in India so far, "the next 100 million Internet users will not be fluent in English". That’s one hundred million reasons to start thinking about translations into India's myriad local languages. India is the second most populated country on the planet. On current projections it will soon have more people than China. China is currently the world's largest smartphone market. India is expected to jump into second place ahead of the USA as soon as 2017. A reminder, every smartphone and tablet out there is a device people could be reading our ebooks on. So should we be focused on the US market and ignore the rest of the world? We can and of course should all stay focused on the big western market(s) that sustains us now. But it’s not rocket science to see the way things are going. The US and UK markets are not going to get any less crowded with titles. Just the opposite. If we’re not big name authors then getting discovered is a growing challenge. The more titles we have out, the more chance there is a reader will find us. Which brings us back to E Unum Pluribus. From one, many. What’s that all about? Put simply, if you’ve got 2 titles in English then, obviously, you’ve just 2 titles in your global catalogue. But get those 2 titles translated into French and you suddenly have 4 titles available, and have added tens of millions of French-speaking readers to your potential audience, pretty much without having written an extra word. Now get those same 2 English-language books into Spanish. Your 2-book portfolio has suddenly become 6, and you have a readership not just in Spain but across most of Latin America, in the USA and around the world. Add Italian and German translations to your repertoire and you increase your 2 book portfolio to 10 titles. Add Portuguese, Dutch and Japanese translations to the list... And why not go for broke and throw in some Chinese translations too? When complete your two titles will have become 2 x English, 2 x Spanish, 2 x Portuguese, 2 x French, 2 x German, 2 x Italian, 2 x Dutch, 2 x Japanese and 2 x Chinese. Your 2 English-language titles have suddenly become 18 titles. 5 English-language books? How does 45 titles in your global portfolio grab you? And did I mention box-sets? But why stop there? As said earlier, I’m actively seeking translation-partners in Vietnamese, Indonesian, Filipino, Turkish, Polish, Hungarian, Romanian, Swedish, etc. None of these are random choices, but driven by the way the nascent global markets are shaping up. "But I can’t afford to get even one of my books translated into one language, let alone all of them translated into more languages than I’ve had hot dinners. How much is this costing you?" A lot less than you'd think, is the answer. Translation Partnerships: Fiberead and Babelcube. Translation costs? Well, no question translations can get very expensive. Serious money. I know some indies who went that route very early on and still are nowhere near recouping their costs. Paying big money for a translation that you cannot easily distribute or promote in the relevant countries is probably not a good idea. Which is why I've long advocated the partnership model, where the translator takes on the task with no up-front payment, instead working on the promise of a share of the royalties when that title sells. This gives the translator the incentive not just to do an outstanding job, but also to help promote and market that title in the local language once the job is done. At which point you'll be asking, "But how do you find even one translator, let alone dozens, willing to work for nothing on your book in the hope they might get paid down the road?" Time to share the indie world's best kept secret. Translation-aggregators. Fiberead is based in China and will take your English-language book, translate it into Mandarin, format it and provide a cover translation, and make it available in China's many ebook retailers, including the Kindle China store, but also some much bigger players. Fiberead charge nothing up front and pay you royalties on all sales. I've got five titles live and selling in China right now (some have made the bestseller list) and I will be uploading another half dozen to Fiberead before the year's end. Fiberead are also getting my titles into paper in China. Babelcube has a different model. They provide a meeting place and a safe-house for authors and translators to pitch their wares and secure deals. You sign up with a translator (you need to do your homework carefully to be sure they are any good) and upload your work. The translator uploads their version down the road. When both parties are happy, Babelcube will get the book on retail sites around the world and pay both translator and author from the sales. Again, no up-front costs, although in this instance you need to get your own cover translation. I've got a number of titles being translated into different languages through Babelcube, and several are already out there and selling. Babelcube offer ten languages. Fiberead just Chinese. But that gives authors an easy route to get started with eleven languages. And another player, Douban, is about to open up to western indies wanting to sell in China. Watch out for an announcement at the Frankfurt Book Fair in October. Those who want to explore the translations paths further will find two posts here covering several different translation models. (LINK) and (LINK). Everything from paying for your translations outright to using translator-aggregators to teaming with a traditional publisher. And for those who'd rather let a publisher do all the hard work, here's a post on how to query foreign-language publishers when you don’t speak their language. While Babelcube and Fiberead are great, I find it more satisfying still to find my own translation partners, and of course in far more languages than they offer. I love exploring uncharted waters. By chance I was researching Thor Heyerdahl for my newly-launched travelogue-memoir series West Africa Is My Back Yard. The first of the series is already available in Spanish, will be out in Portuguese and German later this year, and a half dozen more languages sometime in 2016. Which sounds exciting until you consider Thor Heyerdahl’s flagship book The Kon-Tiki Expedition has been translated into seventy languages. Well, the new globile world is every bit as uncharted as the waters the Kon-Tiki sailed in, and anything Thor Heyerdahl can do I can do too. So it's 71 translation languages or bust! 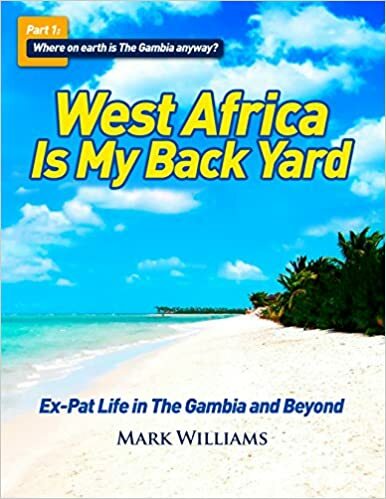 Mark Williams, @MarkWilliamsInt "The International Indie Author" is an ex-pat Brit living in The Gambia, West Africa. He's a novelist, TV scriptwriter, playwright and freelance travel writer. He's the author of the international best-selling novels Sugar & Spice and Anca's Story, currently marketed`under the Saffina Desforges brand, and co-author with Saffina of the "Rose Red" crime thriller series. He was the biggest-selling indie author in the UK in 2011 and has since topped the charts in other countries including France and China. In 2014 he became the first and so far only indie author to reach number one in Amazon’s Kindle China store. You can read his blog here, and join his FB group "The International Indie Author, Your Guide to Going Global." Join Mark Williams on the first part of this odyssey through the history, geography, culture and daily life of the country he calls his home - The Gambia and the region he calls his back yard - West Africa. If you like Bill Bryson's travelogues that leave no stone unturned to share the author's fascination with the world around him, you'll love West Africa Is My Back Yard. All proceeds from the series go towards supporting, babies, children, families and schools in The Gambia. Writers' Village International Short Fiction Award winter 2015. Cash prizes totaling $3200.Ten further Highly Commended entrants will have their stories acknowledged at the site and gain a free entry in the next round. Entry fee $24 INCLUDES A PROFESSIONAL CRITIQUE. Any genre of prose fiction may be submitted up to 3000 words, except plays and poetry. Entries are welcomed worldwide. Multiple entries are permitted. Deadline: November 30th. RROFIHE TROPHY NO-FEE SHORT STORY CONTEST NO ENTRY FEE. For an unpublished short story. Minimum word count 3,500; maximum to 5,000 words. Winner receives $500, trophy, announcement and publication on anderbo.com. Deadline October 15. Glimmer Train Press Family Matters Prize: $1,500 and publication in Glimmer Train. Entry fee $18. Stories up to 12,000 words: about families of all configurations. Deadline: September 30. Tom Howard/Margaret Reid Poetry Contest $4,000 in prizes. Entry fee $10 per poem. Submit poems in modern and traditional styles, up to 250 lines each. Deadline: September 30.